For his fourth solo exhibition at Flowers Gallery, Cedric Christie presents a new series of sculptures and works on paper, expanding his ongoing negotiation of the boundaries between painting and sculpture, and the formal interactions of colour, shape and surface. 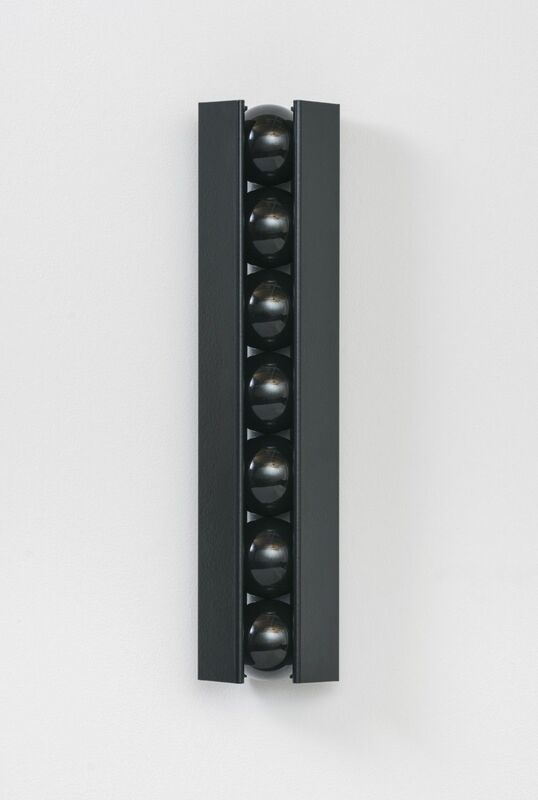 Constructed from painted stainless steel angle bars and coloured plastic spheres, Christie’s sculptures appropriate the sensory allure of the manufactured consumer object, incorporating industrial fabrication processes, such as stove enamelling. 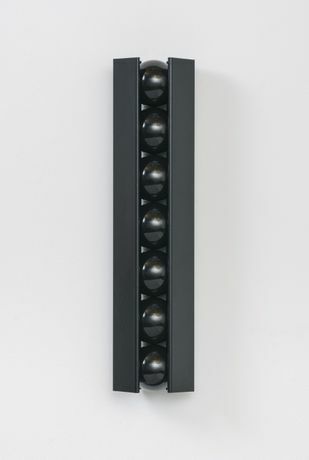 The spheres, with their seductive high-gloss surfaces and vivid hues, provide Christie with a readymade palette (white, red, purple, green, blue, brown or black) with which to ‘paint’ his three-dimensional forms. His serial arrangements explore the rhythmical interplay of tension and harmony between their coloured surfaces. Titles such as The Emotion of Salieri and The Passion of Amadeus evoke the love and rivalry between the two classical composers (as shown in the film Amadeus by Milos Forman, 1984), reflecting Christie’s balance of synergistic and opposing forces. Continuing his critique of the history of modernism, and marking a development of the series ‘Black & White Paintings of Colour’ (1996), Christie describes the works as monochromes, referring to both the material and transcendental properties of pure colour. Christie says: “In a world that has naturally progressed to a situation where we are bombarded with the visual through the media, where we are saturated with its reproduction, could it now be ‘the time of the object’?” With an economy of form and colour, Christie transforms everyday materials into objects of contemplation, in which we can consider the essence of our relationship to the material world.